See this month’s exclusive offers on select new Nissan vehicles. Sell or trade us your vehicle. Click the button below to submit your trade details. Fill out our quick online application and get approved today! 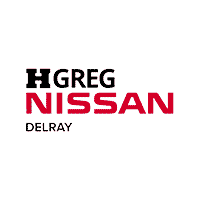 At HGreg Nissan Delray, we pride ourselves in top-notch service and offer a superb selection of new and used Nissan models near you. Our expert staff is ready to help you make truly informed decisions about everything from buying a new or used car, servicing your vehicle and giving you the best trade-in value for your old vehicle. We offer a wide array of new Nissan’s such as the Maxima, Rogue, Altima, Sentra, Pathfinder, Frontier and Versa at the best price in South Florida. Our team at HGreg can make selecting your new car a stress-free process. To learn more about each model like the popular 2019 Altima sedan or fun and functional Pathfinder SUV, browse our showroom or come in and test drive to get personalized help with selecting your new car. Interested in a pre-owned model instead? Here at HGreg Nissan Delray, we ensure that all pre-owned vehicles are in top-notch condition. You have the option to select a used Sentra, Pathfinder, Altima or any Nissan Model. However, you’ll also find an extensive lineup of other pre-owned makes and models. We know that quality and reliability are critical aspects for any automotive purchase of a new or used car. With that in mind, we at HGreg Nissan Delray work diligently to ensure all our used cars measure up to our uncompromising standards before they make it onto our lot. 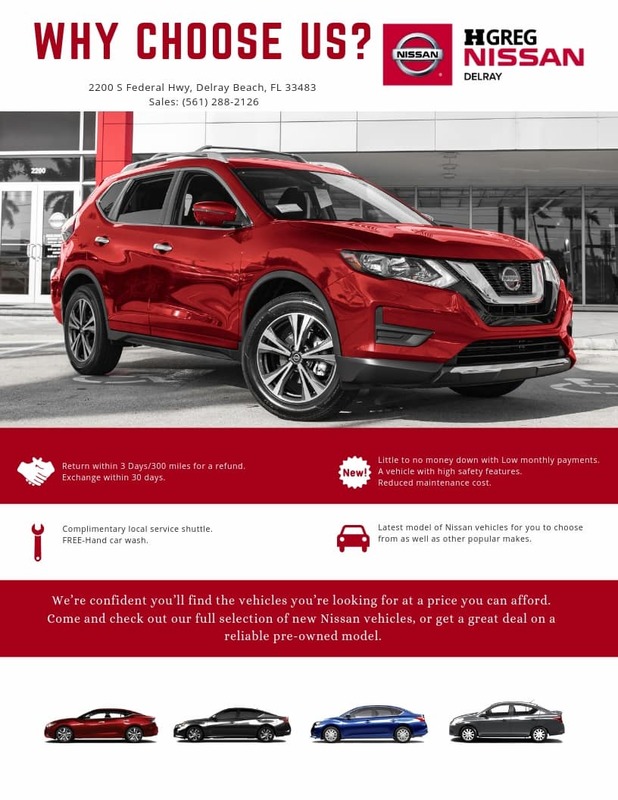 We could write all day about everything we have to offer our valued customers at HGreg Nissan Delray, but we would love to show you firsthand. To reach our sales department call us at (561)-666-4915 or follow directions to 2200 S Federal Hwy, Delray Beach, FL 33483, today. Whatever your automotive needs may be, we will work incredibly hard to meet them.